Suicide in Ireland, particularly among male teens, is on the rise. Sharon Ní Chonchúir reports. Few teenagers make a mark on Irish society in the way 16-year-old Tralee native Donal Walsh did. Having battled cancer on three separate occasions, Donal finally succumbed to the disease in May. But before he died, he spread a serious message. He spoke out urging people, especially young people his age, not to commit suicide. Donal took to the national airwaves with his message and even made a memorable appearance on The Late Late Show. He’s not the only one to have spoken out about suicide in Ireland either. Irish-American comedian Des Bishop made reference to it in his latest TV documentary Under the Influence when he linked Ireland’s high alcohol consumption with high rates of suicide in the country. But what exactly is the situation with suicide in Ireland? Is it as worrying as both Donal and Des maintain? In Ireland, approximately 500 people commit suicide every year, a figure that gives us the sixth lowest suicide rate in the EU (Greece has the lowest and Lithuania has the highest). However, many people who work in the field of mental health believe that suicide figures are underreported and that the true figure from Ireland is likely to be closer to 700 a year. “That’s two people every day,” says Noel Smyth, Chairman of Turn the Tide of Suicide, “3Ts,” a charity founded in 2003 to raise awareness of the problem of suicide in Ireland and to raise funds for research, educational support and intervention. In a 3Ts report called Suicide in Ireland published in May this year, Dr. Kevin Malone, a Professor in the Department of Psychiatry, Psychotherapy and Mental Health at University College Dublin, looked at 104 Irish families bereaved through suicide between 2003 and 2008 and found worrying results. It was already common knowledge that most suicide victims are male, roughly 80%; what people hadn’t realized is how serious the problem was among younger men. Dr. Malone’s report found that suicide was the leading cause of death for young men in Ireland and that the country was the fourth highest in the EU in the 15-to- 24-year-old age group. By analyzing almost 12,000 suicide deaths in those aged 35 and under, the report identified a four-fold accelerated suicide count up to age 20, leveling off from the age of 21 onwards. Families interviewed for the report stated a general lack of satisfaction with the treatment given to their loved ones before they died and the services they received in the aftermath of their deaths. Sixty-six percent reported dissatisfaction with health services, 20% with justice services and 8% with education. This report isn’t the only worrying recent finding. A 2011 Mental Health Barometer conducted by pharmaceutical firm Lundbeck found that stigma and embarrassment still surround depression in Ireland. Forty-two percent of those interviewed said they would not want someone close to them who is dealing with depression reaching out to them for help, although they did acknowledge that talking and having someone listen is a step towards recovery. We can conclude then that Ireland has a problem. But what is being done about it? Who, apart from Donal Walsh, Des Bishop and 3Ts, is speaking out and trying to do something? Console, the national suicide charity, is backing some of the recommendations made in Dr. Malone’s report. They are especially interested in his call for the creation of a real-time database for teen and young adult suicides. Aware, an organization that provides support, information and education about depression and related conditions, takes the view that the threat of suicide is increased in times of recession. If that’s what mental health organizations would like to see the government doing, what are they actually doing at the moment? The National Office for Suicide Prevention (NOSP) is in charge of the implementation, monitoring and evaluation of “Reach Out” – the national strategy for action on suicide prevention 2005-2014. In this ten-year plan the NOSP works with more than 50 agencies and organizations nationwide. In 2011 (the last year for which information has been collated), the NOSP had several key achievements. They allocated €1million extra to 22 new projects including training programs for frontline medical staff and improving intervention services for people who engage in suicidal behavior. They developed “Your Mental Health,” a campaign involving radio advertisements and a website that focussed on the importance of good mental health. And they also started work on responding to suicide clusters and developing national guidelines for post primary schools on mental health and suicide prevention. However, their work has only just begun and in the meantime, organizations such as Console and Aware, academics such as Dr. Malone and committed individuals such as Donal Walsh and Adam Harris are trying to fill the gaps. Eighteen-year-old Adam from Greystones in Wicklow designed the GraspLife phone app after witnessing the effect of suicide on his own community. His app enable users to find help in their locality quickly by bringing together all contact details for organizations such as Aware, The Samaritans and Console. Adam is currently in talks with Three (one of Ireland’s largest mobile phone providers) about pre-installing the app on all new handsets. 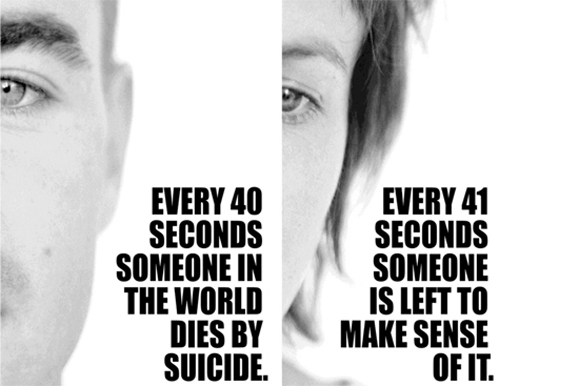 The statistics show that Ireland has a suicide problem. A cursory glance at the figures implies that we compare favorably with other EU countries but in-depth investigation belies this. Irish men and particularly young Irish men have a higher risk of suicide than those in other countries, and more needs to be done to address this at an official level. Sharon Ní Chonchúir lives and works in West Kerry. Much of her writing is concerned with the changing face of modern Ireland.